Fuses are sacrificial devices used to protect much more expensive electrical components from the damaging effects of overcurrent. Fuses consist of a low-resistance metal or wire that is used to close a circuit. When too much current flows through the low resistance element of the fuse, the element melts and breaks the circuit. This keeps the excessive current from continuing down the circuit to more expensive equipment. Fuses can also help make your control systems UL and NEC compliant. However, fuses are not the only devices that you can use to protect your gear from overcurrent. There are many other ways, like circuit breakers or protective relays, and here are 10 reasons why you might just want to consider fusing instead. Overcurrent protective devices that have tripped are often reset without first investigating the cause of the fault. Electromechanical devices may not have the reserve capacity to open safely when a second or third fault occurs. When a fuse opens it is replaced with a new fuse, so the protection level is not degraded by previous faults. Our current limiting fuses meet the UL and NEC codes. Fuses typically are the most cost-effective means of providing overcurrent protection. This is especially true where high fault currents exist or where small components such as Control Transformers or DC power supplies need protection. With most low voltage current limiting fuses (< 600 volts) having a 200,000 amp interrupting rating, you are not paying a high premium for a high interrupting capacity. Current limiting fuses from AutomationDirect meet the UL and NEC codes. Fuses have no moving parts to wear out or become contaminated by dust or oil. Tri-National Standards specify fuse performance and maximum allowable fuse Ip and I²t let-thru values. Peak let-thru current (Ip) and I²t are two measures of the degree of current limitation provided by a fuse. The high current limiting action of a fuse minimizes or eliminates component damage. Devices with low interrupting ratings are often rendered obsolete by service upgrades or increases in available fault current. Updated NEC and UL standards are causing the need for potentially expensive system upgrades to non-fused systems. Fuses can be easily coordinated to provide selectivity under both overload and short-circuit conditions. Fuses do not require periodic recalibration as do some electromechanical overcurrent protective devices. As a fuse ages, the speed of response will not slow down or change. A fuse’s ability to provide protection will not be adversely affected by the passing of time. If you have decided to fuse, don’t let the fuse lingo con-fuse you! I²t (Ampere Squared seconds): A measure of the thermal energy associated with current flow. I²t is equal to (IRMS)² x t, where t is the duration of current flow in seconds. Clearing I²t: The total I²t passed by a fuse as the fuse clears a fault, with t being equal to the time elapsed from the initiation of the fault to the instant the fault has been cleared. Melting I²t: The minimum I²t required to melt the fuse element. Ampere Rating: The continuous current carrying capability of a fuse under defined laboratory conditions. The ampere rating is marked on each fuse. Available Fault Current: The maximum short-circuit current that can flow in an unprotected circuit. Coordination: The use of overcurrent protective devices that will isolate only that portion of an electrical system that has been overloaded or faulted. Current-Limiting Range: The available fault currents a fuse will clear in less than ½ cycle, thus limiting the actual magnitude of current flow. Element: A calibrated conductor inside a fuse that melts when subjected to excessive current. The element is enclosed by the fuse body and may be surrounded by an arc-quenching medium such as silica sand. The element is sometimes referred to as a link. Fault Current: Short-circuit current that flows partially or entirely outside the intended normal load current path of a circuit component. Values may be from hundreds to many thousands of amperes. 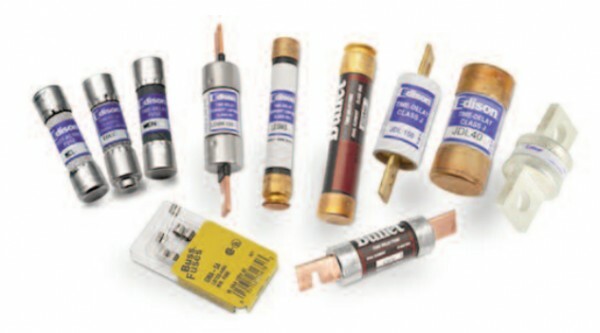 Ferrule: The cylindrical brass, bronze or copper mounting terminals of fuses with amp ratings up to 60 amperes. The cylindrical terminals at each end of a fuse fit into fuse clips. Interrupts all available overcurrent within its interrupt rating. Interrupting Rating: The maximum level of fault current that the fuse has been tested to safely interrupt. 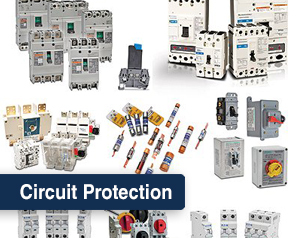 To read more articles about circuit protection, click here. Fuses or Circuit Breakers: Which should you use?